Pro Se Productions, an independent publisher of Genre Fiction, announces the release of its latest digest novel. Author Thomas R. Skidmore introduces the ultimate conflict between right and wrong on a cosmic stage as well as team of heroes like no other. The Sigil Masters arrive to save humanity in Skidmore’s Moondrive, available in print and digital formats from Pro Se Productions. They never knew the battle that was coming would be ALL OUT WAR! In the distant star system of Gerandra, the Dark Queen named Syrinx plots her ultimate ambition: the annexation of the Solar System, and the systematic subjugation of all humanity. To this end, she commands her team of specialists known as the Science Guild to devise a means involving not one, but two moons. Unknown to her, however, she and her Guild are being watched by the quasi-beings called the Elders of the Wind-Light, who even now prepare to bestow a great power to three young Earthmen. These young men, veterans of a great cosmic war, come to be known as the Sigil Masters. Soon a battle of wits between good and evil must be fought... before Humanity’s time runs out! Join the adventure in Moondrive by Thomas R. Skidmore. From Pro Se Productions. 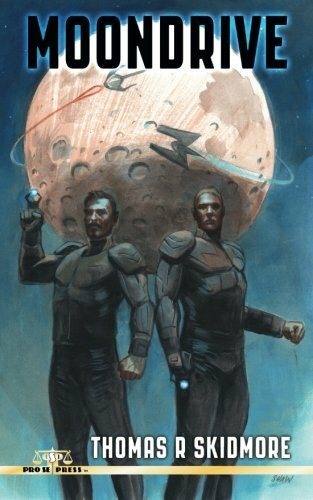 Featuring a stunning cover by Adam Shaw and print formatting and logo design by Forrest Bryant, Moondrive is available now at Amazon at http://www.amazon.com/gp/product/1518643698?keywords=moondrive&qid=1445872695&ref_=sr_1_1_twi_pap_1&sr=8-1 and Pro Se’s own store at www.prose-press.com for 10.00. Skidmore’s science fiction digest novel is also available as an Ebook for only $2.99, designed and formatted by Bryant for the Kindle at http://www.amazon.com/Moondrive-Thomas-R-Skidmore-ebook/dp/B016YP9R5I/ref=tmm_kin_swatch_0?_encoding=UTF8&qid=1445872695&sr=8-1 and for most digital formats via Smashwords at https://www.smashwords.com/books/view/586901.